The show at the Fletcher Opera Theater, Duke Energy Center for Performing Arts, Raleigh, NC enjoyed a tremendous success. 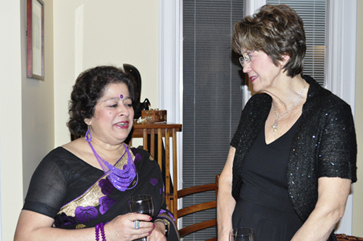 The organizer was the Ramakrishna Vedanta Society of North Carolina, USA. 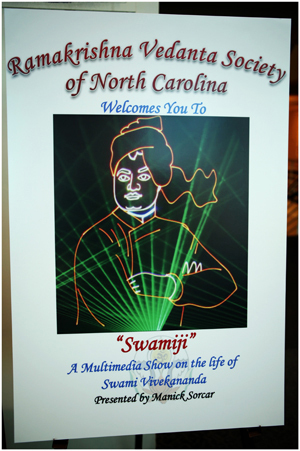 The event, which celebrated the 150th Birth Anniversary of Swami Vivekananda, was an approximate 1.5 hour program consisting of a live performance in combination with laser for the Prayer and Vandana, followed by the hour long, famous laser documentary “Swamiji”. 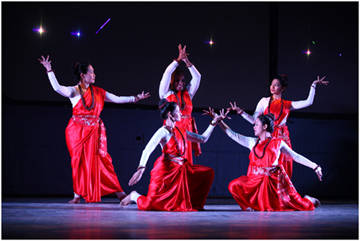 The enchanting dances were performed by a local group under the direction of Rinku Bhattacharya Das. 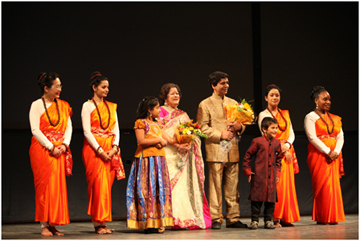 The captivated, packed-auditorium of the Fletcher Opera Theater was in pin drop silence until a burst of thundering applause at the end of the show as Manick Sorcar and his wife Shikha came on the stage to take a bow with the dance group. “Swamiji’s” message of religious harmony and brotherly love touched the heart of all. 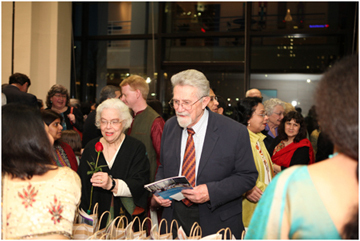 Among the admirers of the show were the Secretary of State, North Carolina, and the Urban Ministries of Durham (UMD). The preparation for the show had its beginning several months ago. This was a first-of-a-kind show in Raleigh; hence the City, the media and even the National Public Radio (NPR) came forward to welcome it in the great city of Raleigh. 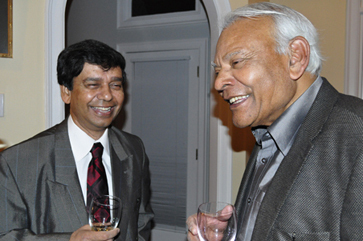 An exclusive radio interview by NPR with the show creator Manick Sorcar and Pravrajika Brahmaprana, the monk from the Vedanta Society of South California took place on February 20, 2014. Manick Sorcar also was interviewed by TV Asia on March 7, 2014. 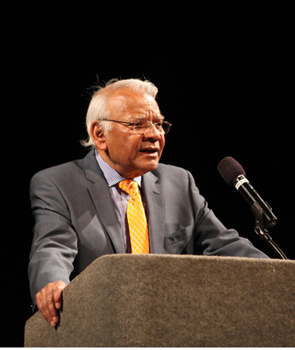 Under the direction of Diju Raha, President of the Ramakrishna Vedanta Society of NC, a highly energetic group of volunteers put an endless amount of time to organize and bring the event to a grand success. 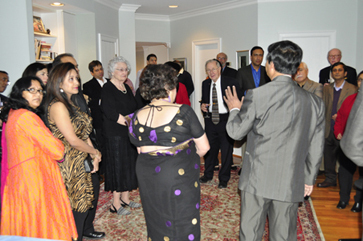 On March 7, 2014, Friday evening, a lavish party was thrown by Diju Raha and his lovely wife Lynne at the their palatial residence to welcome the Sorcars to North Carolina. 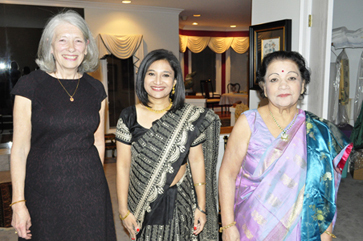 A host of delegates - elites of the society from American as well as Indian community, which included Mrs. Elaine Marshall, the Honorable Secretary of State, NC, graced the event with their presence. Here are some photographs of the event from the lenses of Gowri Goli, a professional photographer and reporter of TV Asia, USA. 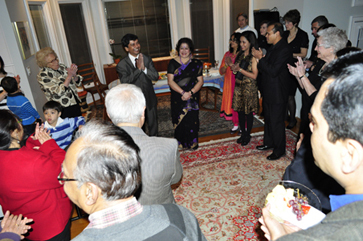 (Left) Manick gives a short introduction of the show taking place the next day (Right) Shikha Sorcar with the Secretary of State, NC. 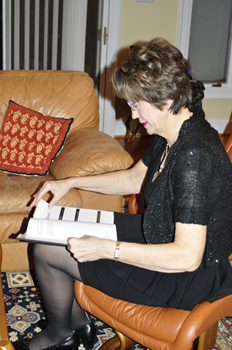 (Top left) Lynne Raha with invited guests; (Top Right) Invited guests; and (bottom) In a leisure moment Ms. Elaine Marshall glancing through the pages of “The World of Manick Sorcar Where Art Becomes Magic”. (Top) A welcoming poster at the lobby of the Fletcher Opera Theater, Duke Energy Center for Performing Arts, Raleigh, NC. 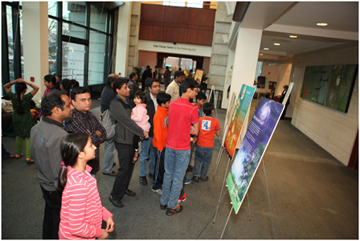 (Left) People start gathering at around 6:30 pm at the lobby, watching the art exhibition on Swamiji. 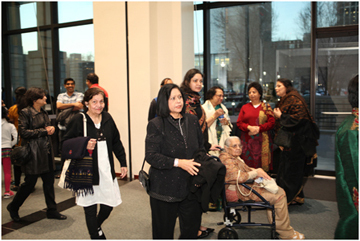 (Right) Stream of people of all demographic flows in to watch “Swamiji”. 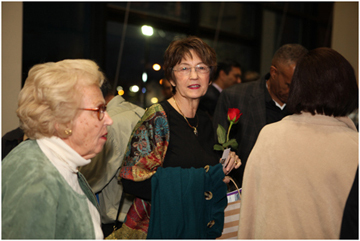 (Left) As a token of love, each lady was gifted a column of rose from the Vedanta Society as they came in. 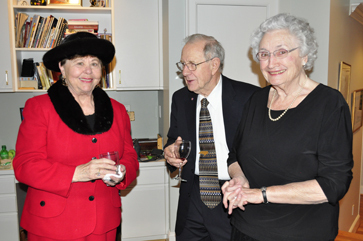 (Right) Mrs. Elaine Marshall, Honorable Secretary of State, NC. 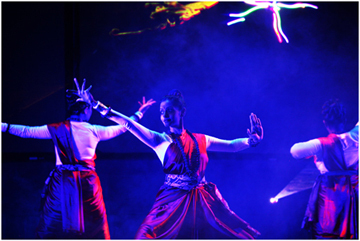 “It (the laser show) highlights some of the most important and soul-stirring messages of Swamiji. 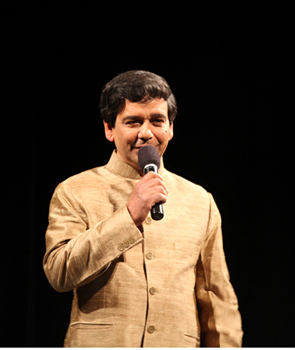 In our view the Western audience would appreciate the show even more because Swami Vivekananda’s message of harmony has been beautifully highlighted”, wrote the RKM of New Delhi, after watching the show in India. (Top left) March 8, 2014, 7 pm. 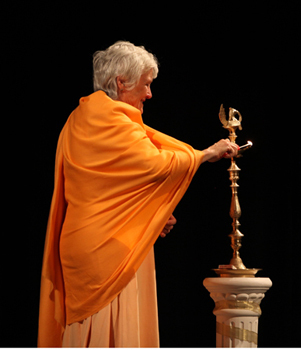 Diju Raha, President of Ramakrishna Vedanta Society of NC delivers the Welcome Address; (Top Right) Chief Guest Pravrajika Krishnaprana lights the lamp, and (Above) Manick Sorcar gives a brief speech before starting the show. felicitated by the Vedanta Society - flowers are handed by two little children.